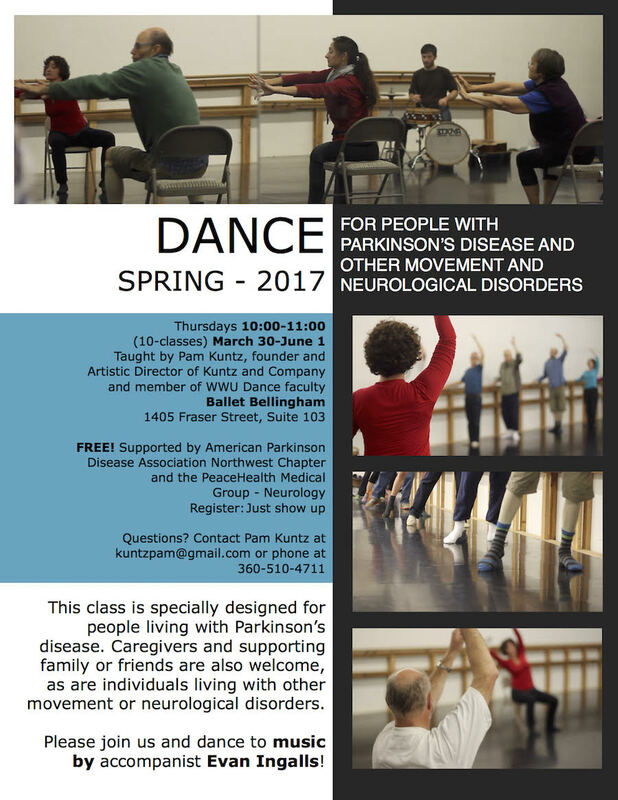 Seattle Theatre Group®’s Dance for PD® program is offered in collaboration with Northwest Parkinson’s Foundation, Des Moines Legacy Foundation, Seattle Parks and Recreation, Center for Healthy Living, Mercer Island Community Center, and Pacific Northwest Ballet. Dance styles/techniques/content covered in class are modeled after the Brooklyn program, using various styles of dance, live music and community to develop artistry and grace while addressing such PD-specific concerns as balance, flexibility, coordination, isolation and gait. For more information and a schedule of Seattle’s varied classes please click here. To register for classes, please contact the Seattle Theatre Group Program Manager at shawnr@stgpresents.org or 206-518-5232. Drop-ins welcome, but preregistration is recommended. Drop-ins welcome, including persons with MS and other neuromuscular conditions. No previous dance experience necessary; participants may stand or sit as preferred. $10 per class; Carepartners and spouses may attend free of charge. Dance styles/techniques/content covered in class: Modeled after Brooklyn program, designed to engage participants’ minds and bodies through many styles while addressing such PD-specific concerns as balance, flexibility, coordination and gait. For more information: contact Kayla Oakes by email: kdoakesclan@gmail.com or Darlene Jones at (360) 457-5352 or by email: djones@olypen.com. Sponsoring organizations: American Parkinson Disease Association Washington Chapter and Boundary Bay Brewery & Pickford Film Center. For more information, call (360) 510-4711 or send an email to kuntzpam@gmail.com.